Poets likened love to a disease, Donne called it a canker worm, eating at the tender rose, like a cancer or virus weakening the host cell. But The Beatles said all you need is love, to save, to heal, to act as a salve curing the loneliness or hurt that ails you. In fact, studies have been conducted detailing the connection between romantic love and dopamine production. Researchers exposed subjects to pain, and then showed them images of their romantic interests. Not just attractive people, but people subjects were specifically attracted to. Love interests. Staring at even just images of that person not only reduced the sensation of pain, but the brain actually produced higher levels of dopamine when experiencing pain while looking at those images. They tested again by simply distracting the subjects while exposed to pain, which also resulted in reduced pain sensation, but utilized an entirely different part of the brain and did not modify dopamine production. In short, love, romantic love, almost maybe I could be in love, object of my like like really like you affection, let my guard down and have feelings for you, trust you, tentatively hand you my still beating organ and hope you won’t squish it love, is the equivalent of morphine or cocaine and can indeed produce a high. That buzz that makes falling feel like flying is actually a change in the chemical makeup of our brains, transforming every single metaphoric song lyric and line of poetry into reality. You can get addicted to love. If falling in love really is a drug, then the withdrawal symptoms are just as real. You spend time with your special somebunny and you’re happy, elated, high. You walk taller, grow confident, become the best version of you because they inspire you to. You’re drunk on the thought of him. The high is great, but that shaking, paranoia, anxiety, depression that comes after? That’s all real. That’s the crash from bingeing on the boy-shaped love drug. It messes with your mind. What if he starts to pull away, just a little at first: too busy, less communicative, connectivity drying up like a dealer’s supply chain and one day there is no more to be had. You get that sinking-pit-of-your-stomach feeling: that was the last hit – the last time you’ll see him. That’s why you go to the gym after a breakup; exercise has been shown to produce similar, but reduced, dopamine effects on the brain. Or you immediately start dating someone else; its not a rebound, its methadone. What if he doesn’t get addicted? What if, once the pain is gone, he forgets the drug? No one wakes up and thinks wow, I don’t have a headache, let me not take ibuprofen. People simply go about their day. How do you become a drug needed daily? Like Tamoxifen, requiring a 5 year commitment? Or methotrexate, taken only once a week, but as soon as the effects begin to wane, its time for another dose? What if you go too far? What if you become the disease and the cure all at once, an impotent viral strain inoculating the host to further advances. Like polio or smallpox, you worm your way under the skin, imprint your bacteriophage on every cell memory, but in the process eradicate the need for further treatment. Baby, I guess I’m your vaccine. If my love is a drug that can soothe/heal/protect others, where does that leave this strung-out, junkie heart? I think I’ve made these for everyone I know, to the point that I have the recipe committed to memory – except I reread the actual source for this post and realized I’ve been making them “wrong” for years. But if this is wrong, I don’t want to be right. They’re easy, cheap, so much better than pumpkin pie for Thanksgiving, and taste like little clouds of happiness. I think they also increase dopamine production because no one ever wants just one, and everyone gets sad when they are gone. Preheat the oven to 350 degrees . Line two baking sheets with parchment paper or silpats. In a large pot over low heat, melt butter. Remove from heat. In a separate bowl, sift together flour, nutmeg, cinnamon, ginger, clove, baking powder, baking soda and salt and mix well. Set aside. When pot of butter is cool to the touch, whisk in brown sugar until smooth. Whisk in the eggs, pumpkin puree, and vanilla. Using a rubber spatula, fold in the flour mixture. Using an ice cream scoop or tablespoon, drop 12 generous mounds of batter, spaced evenly, onto each baking sheet. Bake until springy to the touch, about 10-12 minutes. Transfer to a rack to cool completely. Meanwhile, using an electric mixer, cream the butter with the cream cheese. Add the confectioners’ sugar and vanilla; beat on medium-high speed until fluffy, at least 2 minutes. Spread the flat side of 12 cakes with the cream cheese frosting. Top each with another cake. Eat. 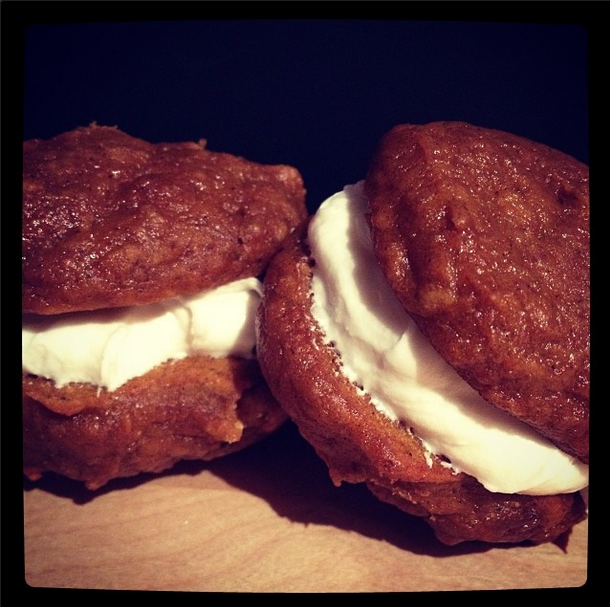 Tags: cream cheese frosting, east to make, fall, fall dessert, fall flavors, halloween dessert, holiday, one pot recipe one bowl recipe, pumpkin, pumpkin pie alternative, pumpkin recipes, pumpkin whoopie pies, thanksgiving, thanksgiving dessert, whoopie pies. Bookmark the permalink.